The Dillon County Health Initiative has had a very busy spring and summer. Our Pop Up Farmers Market started earlier this spring and will continue through October. The market is held the second Monday of each month from 4-6 p.m. in the South Plaza downtown Dillon. Each month there will be live entertainment. New vendors are always welcome. Spring vegetable and herb plants were distributed to over 200 home gardeners. Applications are now being taken for the fall plant giveaway. NO applications will be taken during these distribution times. Anyone who did not fill out an application beforehand may pick up plants on August 22 from 3:30-4:00 p.m. behind the Clemson Extension Office. Also this spring, DCHI provided six raised bed gardens and soil to Lake View Elementary School. Under the direction of Mrs. Pam Gasque, classes used many learned skills to plant three vegetable and three pollinator beds. Students researched what plants were best for attracting pollinators. They also learned proper planting techniques and were able to pick squash and peppers before school’s end. Students were responsible for watering and weeding beds daily. 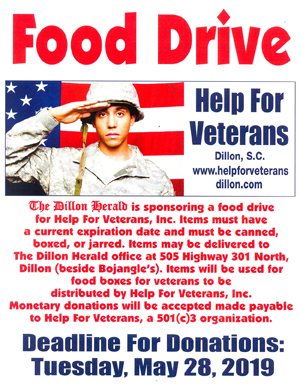 If you would like any further information on any of these programs, please visit our website www.rali-dchi.com, email us at [email protected], Like Us on Facebook at Dillon County Health Initiative or Pat Laird 843-845-2875.